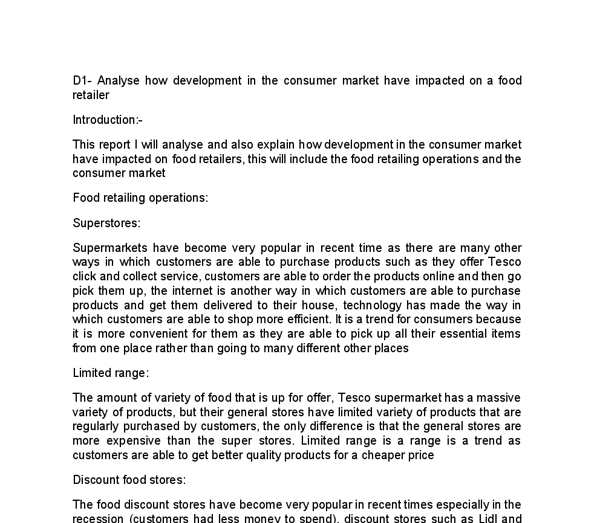 ﻿D1- Analyse how development in the consumer market have impacted on a food retailer Introduction:- This report I will analyse and also explain how development in the consumer market have impacted on food retailers, this will include the food retailing operations and the consumer market Food retailing operations: Superstores: Supermarkets have become very popular in recent time as there are many other ways in which customers are able to purchase products such as they offer Tesco click and collect service, customers are able to order the products online and then go pick them up, the internet is another way in which customers are able to purchase products and get them delivered to their house, technology has made the way in which customers are able to shop more efficient. It is a trend for consumers because it is more convenient for them as they are able to pick up all their essential items from one place rather than going to many different other places Limited range: The amount of variety of food that is up for offer, Tesco supermarket has a massive variety of products, but their general stores have limited variety of products that are regularly purchased by customers, the only difference is that the general stores are more expensive than the super stores. ...read more. due to the internet there has been a massive trend in online shopping Continuing changes: Continuing changes can relate to Tesco plc click and collect service, which is an extension of the internet website that Tesco PLC have introduced, they have done this in order to make customers internet experience more convenient. Continuing trends include customers wanting value for money products especially due to prices increasing and also due to customers being more health conscience Customer expectations and demands: Customer expectation and demands have increased and Tesco PLC have adapted to this through their increase of training in staffing to adapt to the changes, the introduction of new services such as click and collect, and internet shopping, have allowed them to adapt to the demand. Changing social and working patterns: Social changes and working patterns have changed in reason years are more and more people are health conscience so due to this Tesco PLC have been able to adapt to the social change through offering a wider range of healthier foods. They recognised these changes from the data they collected from their clubcard Affluence: Affluence is about the income of the families they are wanting to attract, an example of this ...read more. having a lot of stock on Friday and Saturday as those are the days customers do their shopping, they have to also have the right amount of stock on international football match days as customer buy food before the match Technology and data use to tailor product range to consumer profiles: The clubcard is a service in which data is used to tailor products range to customer profile an example of this is when customer purchase products from Tesco PLC the scan their clubcard to get clubcard point, the card then transfers all the data about what products were bought but which customer on their profile, Tesco PLC is then able to use the information they have received to tailor advertisement that would attract the customer, they will also send personnel emails telling customers that there is a sale on a products that they regularly purchase, they may also refer products that are relevant but a new brand to the customer e.g. 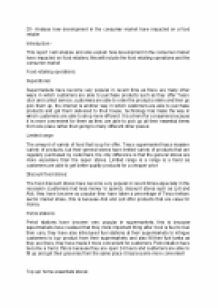 they may refer a new tea brand if the customer regularly purchases tea products Conclusion: This report I have analysed and also explained how developments in the consumer market have impacted on food retailers, this will include the food retailing operations and the consumer market. ...read more. Tesco Monaghan being located in the Republic of Ireland has noticed that on Northern Ireland bank holidays, their sales increase on average by 25%. Therefore in order to try and capitalise this and maximise profits, Tesco Monaghan distribute promotional flyers to bordering counties including: Fermanagh and Tyrone. Because technology have become advanced which means that people are able to find cheap broadband for their technological items, which makes it more simple as they can receive their product in store. It has also impacted on food city stores. them get a bigger awareness to the public, if they didn?t follow their social responsibilities, they wouldn?t be a popular brand and could suffer sale performance. The disadvantage for Starbucks is they are giving away free coffees and spending more money to set up activities and events to raise money. enormous changes on the consumers market especially though the last couple of decades. For example the way customers shop nowadays is really different compared to the way people used to shop years ago and this is due to huge development and changes that the consumer market has undergone.